Account by Robert Prys Owen, Pencaenewydd. At 8.30a.m. the W/op received a blue warning from Land's End. At 9.23a.m. the Anchises was attacked by a lone Dornier flying at a height of 200ft. 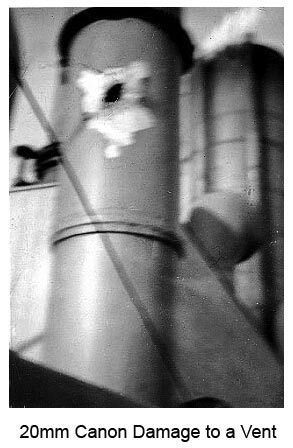 The attack came from over the stern, when 2 bombs were dropped by the ships side without doing any damage. 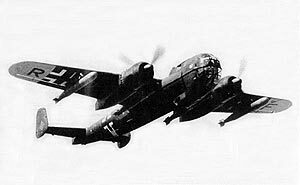 Then he attacked from forward and 2 more bombs – which missed the stern but damaged the propeller and again he attacked from the stern and dropped 2 more bombs on the starboard side, which sprung the plates, thus letting water into the engine room and stoke hold. The plane came back twice. Each time machine gunning and shelling trying for the lifeboats, in the meantime our gunners stuck to their guns and fired about 70 rounds of ammunition when both our guns jammed, after tracer bullets were seen to enter the plane, and silencing one of their guns, and their engine was heard to cough as they made off. The only casualty was one Chinaman with a bullet through the fleshy part of his thigh. At 10.30a.m. the Capt. 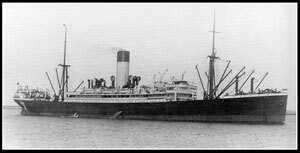 Gave the order for all passengers, steward, firemen to take to the boats, as the ship had started to list and the barometer was going down. While the sailors stayed onboard in case we could salvage her. All the six boats got away without a single hitch. 12 noon the Carpenter took soundings and reported 4B dry and 5 dry all hatches dry with water up to the 2nd platform in the Engine room. The Capt. Send us round to look for food we went to the bake house and found plenty of bread, nothing was found in the pantry or galley. The storerooms were all locked and the storekeeper had the keys with him in one of the boats. At 2p.m. we received an acknowledgement from the commander of the Western approaches to our S.O.S. telling us that a man of war was sent to our assistance. 2.30p.m. the Capt told us that we could go anywhere in the ship and take anything we liked, but leave the booze alone. Just then the sparks received another blue warning from Land's End. So this was not our chance to explore, as we had to go down below to take cover. By now the wind was rising. At 4p.m. the carpenter took another soundings and water was halfway up to the third platform in the engine room just over the cylinders. All except the lookout man remained below till dark. From 4p.m. onward the carpenter took soundings every hour. The water was gaining at the rate of about a foot an hour at 9p.m. he reported 4B tank leaking through the water tight doors. 2ft 2in of water in. 10p.m. no 5 (tank) started leaking. 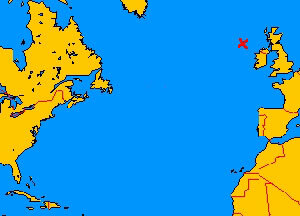 (7.30.The wireless op received a message from the man o-war). Saying that she was 20mls north of us proceeding at 10knots and that she should be up to us by 9.30 and if she wasn't we were to burn a flare every half hour. At 9.30 she was not in sight so flare was lit and one of the boats answered us, and as we couldn't put the flare out we had to throw it over the side and still it wouldn't go out. So every half hour after, we sent a rocket up. In answer to our rocket of 12.30 a destroyer morsed to us when she came up to us the mate morsed to her telling her to look to the boats first. At 12.30 I was sent with a message to Mr. Mathias the 2nd mate who was with the wireless op, telling him that the captain wanted him when he asked me to stop with the w/op to keep him company for 5 min which lasted for 12hrs. 10a.m. Barry came to the wireless room and said “Its all over sparks”, and we thought it was going down there and then but what really happened was a Corvette had come to sight over the horizon aft. So with that sparks said to me "You take these code books to the old man, and I'll bring the log book. Down to the old man we went he was standing on the after end of the boat deck starboard side with Mr. Morgan the 2nd mate, discussing the best way to lower the lifeboat with such a sea running, when we went up to them, the old man told me to dump the code books over the side, and make sure they sink. 10.30a.m .The corvette came up as near as possible to the ship. The old man told us to get the boat ready and to pour the oil we had on the prom deck into the water. I went into the lifeboat with R.D. Jones and the stuff we dumped out included 4 dozen ice cream cups, 50lbs sugar, 5lbs tea, 10 blankets, 2 doz dinner plates, 13 bottles of gin, 4 bottles whiskey, 5 bottles brandy, 20 packages of personal goods, 2 sextants, 4 compasses and the wireless set. 11a.m. Capt James gave the order to abandon ship, Al and Dougie (2 A Bs) were detailed off to lower the boat, while all hands bar the skipper got in the boat (l was in the forward end). Then Al and Dougie slowly lowered the boat to about 6 ft off the water, and another 6 with a rush, but the forward half jammed somewhere and for a minute everybody thought that their last minute had come But Al managed to clear it in time and saved the boat from turning head over heels. The boat dropped with an even keel and Al and Dougie climbed down o.k. to the boat and Captain James tried to do the same but he fell and hurt his side on the gun whale. We then tried to push the lifeboat from the ship side using the oars but as they were old all the oars snapped and we had to use our hands to prevent the boat from being trapped under the ship's counter we then drifted out from the lee of the Ship the waves were 40 ft high and we were at the mercy of wind and sea. The corvette H.M.S. 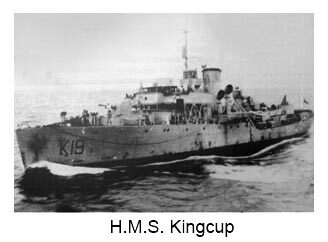 Kingcup then had to maneuver to a position to get alongside. But in doing so the lifeboat was sucked under the Corvette's bow and was smashed in two It was then that the captain of the. . . .
[The account ends here but I believe this is when Captain James of the Anchises, already hurt by the fall, was lost along with one of the Quartermasters as 20 men were spilled into the water]. 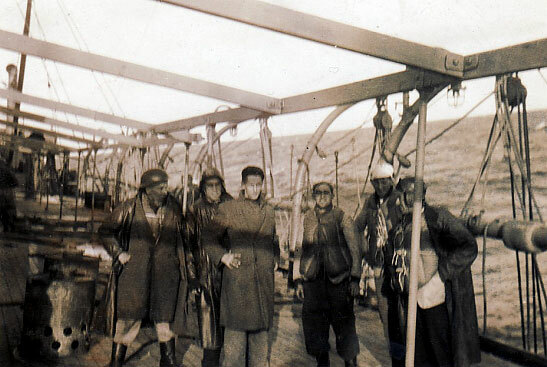 Shipmates of Robert Prys Owen of Pencaenewydd (Blue Funnel Line 1937 – 1946) waiting to abandon ship. In there somewhere is Doug Jardine, Dickie, Barry, Robert A Jones, Joe O’Neill and William. Behind the camera Robert Owen, 18 years old a keen amateur photographer at this stage but after he lost another camera in the Indian Ocean he gave it up! Many thanks to Mr. Roger Owen for sending us his late fathers account and photographs.